Our mission is to supply the latest news and information to electrical engineering professionals keeping them informed and educated on requirements to design, produce, and market their products around the world. With over 20 years in the industry, our roots run deep in the community of electrical engineering professionals whose primary concern is the regulatory compliance of their company products. 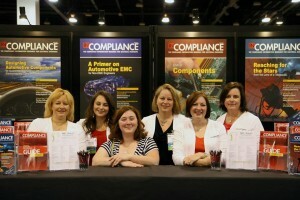 August 2009 brought the launch of In Compliance Magazine. Our Premiere Issue was released at the IEEE EMC Symposium in Austin, Texas where we were welcomed back by friends and supporters anxious for the informational needs of the compliance community to once again be filled. Starting with the January 2010 issue, we resume our mission by publishing monthly issues of In Compliance Magazine, providing the latest industry news on our website www.incompliancemag.com and through semi-monthly eNewsletters. We are proud to continue supporting our community as their preferred source of regulatory compliance information. Your feedback, comments and suggestions are welcome. Please contact us to let us know how we may better serve you.